It's the first and best of the three Ao Oni films so far. (There was another live-action film in 2015 and an animated film in 2017, not counting the short-form comedy series in 2016.) I hadn't been expecting much, but it's quite good. The premise is the same as usual. 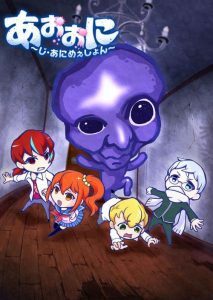 There's a computer game called Ao Oni ("Blue Demon"), where you're stuck in a house with a giant Ao Oni who's trying very hard to murder you. That's true both in real life and in-universe for the film. I don't know why they keep getting meta like that, but they do. Anyway, six teenagers called Anna, Shun, Takuro, Hiroshi, Mika and Takeshi end up stuck in a house with Ao Oni, whereupon it becomes a game of "count the survivors". It's a pretty short film, obviously. They all are. What this one does right, though, is not to get too hung up on the Ao Oni thing. It doesn't begin with Ao Oni grinning to camera. It doesn't blither on for half an hour of investigation of the game and associated legends. Instead it's a fairly straightforward but dark story of some young people that happens to lead them into a very bad place. What's more, after you've finished watching it, it'll be easy to see how Ao Oni might have come into reality given what had happened. It's a haunted house. There's... well, I'll avoid spoilers. The cast are the usual suspects. Hiroshi's still clever (but surprisingly peripheral this time), Takeshi's the coward and Mika's the girl who fancies Takurou (which here makes her fairly worrying). As in 2015, though, the plum role is clearly Takurou. Here, he's scary, bullying and sinister. I think he's involved in drugs, although I might have misunderstood because I was watching in Japanese without subtitles. There's a clever revelation late on that brings everything together and makes one realise that there was more than you'd have guessed underneath this simple "teens trapped in a house with a monster" horror film. Also important, though, are Shun and Anna. They've never appeared in any of the original games, but they're from the Ao Oni novels (and they're also in the 2015 film, although less involved in that one's action). Crucially, the film stays real for as long as possible. The first half-hour doesn't have a single killing and even thereafter it's another ten minutes before we get more than fleeting glimpses of Ao Oni. It feels like a normal film about its human characters, rather than being about the blue monsters from a computer game. That said, though, the killings are convincing and Ao Oni looks right when he eventually appears. Is it just me, or is that close-up of his mouth based on a great white shark's? I don't know if I'd go so far as to recommend this. I was surprised to find myself watching a good Ao Oni film, but it's still a short, small-scale horror flick. It's still mostly built from the usual ingredients. Haunted house. Teenagers being killed. It's not breaking any new ground. However it's not a "cheer for the monsters" slasher flick, with the focus being firmly on the characters (who are being portrayed convincingly). I think it works.